Irish Christmas ornament is a green beer mug with a frothy head along with embossed shamrocks and a gold harp. This Irish Christmas ornament green beer mug that is enhanced with embossed shamrocks along with a gold harp in the center. 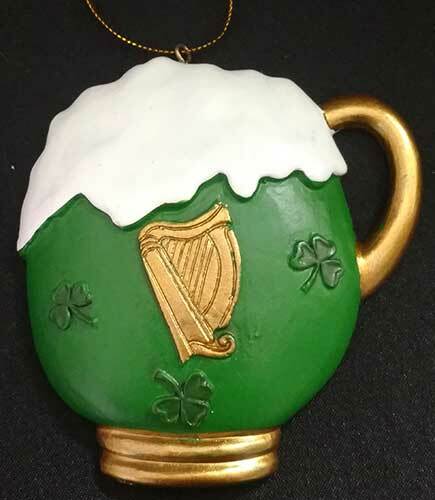 The Irish mug ornament is enhanced with gold accenting along with overflowing foam. The Irish ornament has a dimensional face and is made of resin; it measures 2 3/4" wide x 2 3/4" tall.